At a time when Istanbul is being transformed radically with large-scale privatizations and constructions due to increasing pressures of neo-liberal politics, it becomes an urgent necessity to think and act in order to (re)claim commons in the city. Commons in Istanbul, such as open spaces, the right to inhabit in the city, the right to be informed of the governing and rebuilding of the urban spaces and the freedom of expression in these processes, communication platforms, and nature are under threat of diminishing today more than ever. The emerging laws for transforming the areas in danger of natural disaster (Law no. 5393, in 2005, Law no. 6306 in May 2012) lend strong authority to the state to demolish and rebuild the housing areas in the centre of Istanbul, moving the owners into public housing on the periphery and leaving the tenants unsettled. The law announcing the state woodlands and farmlands on sale (Law no. 6292, in April 2012) makes the natural common lands vulnerable for private development. Forest – parody of real state commercials. At the moment, there are a great number of large-scale projects transforming public coasts, squares and parks into demolition and construction sites in short-term and turning them into private lands in the long-term. Taksim Gezi Park is one of these common sites, where the former barrack building on site is planned to be re-built from scratch in order to house privately controlled cultural and commercial activities. Taksim Square, one of the most important places for public appearance, is now a construction site since November 2012, to be transformed into a large empty space devoid of public density. While in transformation, common memory of the citizens for these places is permanently destructed and erased. For example, the public life of Taksim Gezi Park and the image of Taksim Square as a political scene for large demonstrations are already on hold due to the long-term construction works, and will hardly exist after the planned spatial changes. Similarly, Haydarpaşa Train Terminal where one entered Istanbul and enjoyed its large public stairs is closed at the beginning of 2012 to be turned into a hotel despite public opposition. Taksim Square project construction started by the central municipality of Istanbul on 4 November 2012, when a large group of activists occupied a part of the square shortly. 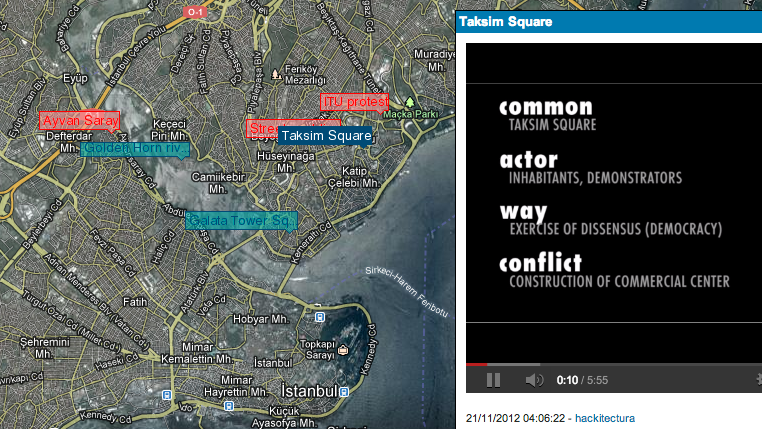 The Mapping the Commons Istanbul Workshop participated and documented the process on site. The biggest problem in these projects is that the whole process of planning, commissioning, and construction is kept inaccessible. The planned projects, which are by law presented to public opinion before being implemented by the Greater Municipality of Istanbul, include insufficient details for a public opinion to be formed. Professional (Chamber of Architects, Chamber of Urban Planners, etc.) and non-governmental organisations, universities, and some of the media struggle for more transparent processes. However, the central authority gives hardly any satisfactory response to these oppositions. In this context, Mapping the Commons Workshop in Istanbul played an intermediatory role in understanding and revealing the conflicts in relation to commons, raise discussions around the concept of commons, and most importantly be a part of the action in Istanbul to create commons, and furthermore map through videos these historical moments when commons are actualized. For this, the workshop initially took place in the street, through, for example, interviewing and filming in Fener-Balat-Ayvansaray, where a common discussion platform is successfully created against the new law of transformation of urban space, in Taksim Square, filming, discussing, and occupying of the square for common use against the authoritative projects, in Tarlabaşı, participating a Kurdish street wedding and a kitchen for the support of immigrants, and in the Technical University of Istanbul, participating and interviewing at a demonstration to claim communication space for employment security. Documenting the privitizations of water reservoirs, the privatizations of Golden Horn shore, and the struggles for public space use at Galata Tower Square. For a detailed discussion on the affects of newly introduced laws on the residential areas in the centre of Istanbul, see, Tuna Kuyucu and Özlem Ünsal, ” ‘Urban Transformation’ as State-led Property Transfer: An Analysis of Two Cases of Urban Renewal in Istanbul”, Urban Studies 47 (7), June 2010, pp. 1479-1499. Instructors:Pablo de Soto (hackitectura.net, Federal University of Rio de Janeiro) in collaboration with Demitris Delinikolas (empty film, University of Athens). Event organizers: Ekmel Ertan (Amber Platform art director) and Aslihan Senel (Istanbul Technical University). Video Project Participants: Gizem Ağırbaş, Burcu Nimet Dumlu, Ecem Ergin, Onur Karadeniz, Fikret Can Kuşadalı, Marco Magnani, Zümra Okursoy, İpek Oskay, Sibel Saraç, Jale Sarı, Yağız Söylev, Ceren Sözer, Neşe Ceren Tosun, Ece Üstün, Wolke Vandenberghe, Daniele Volante, Volazs. The Project is co-organised by amberPlatform and ITU Faculty of Architecture, Department of Architecture between 1-8 November 2012. Fener-Balat-Ayvansaray is a historical residential district in central Istanbul. In this area there is a diminishing non-Muslim community, which inhabit the area for hundereds of years, as well as migrants from eastern Turkey since the industrialization of Istanbul starting in the 1950s. The local municipality introduced an urban renewal project in 2009, with hardly any public interest, and since then the inhabitants have been resisting for their common rights through a public organisation called FEBAYDER. Tarlabaşı is an area in the centre of Istanbul. In this area a diverse community of immigrants live and occupy the streets for different common and everyday activities, such as weddings, festivals, carpet washing. The workshop participated and documented a wedding and immigrants kitchen on 4 November 2012. The workshop participated and documented a demonstration on 5 November 2012 at the Istanbul Technical University Faculty of Architecture courtyard, where proffessors, research and teaching assistants, and students held a festival for claiming the assistants’ employment rights, creating a communication space as commons.